The image to the left shows the metal contribution to the Thor cash flow model that was undertaken in a study in 2014 by Roscoe Postle Associates. Thor is a true 'polymetallic' deposit, with valuable concentrations of silver, gold, lead and zinc. Copper is also a component, but it is not used as the current metallurgical models do not allow for the recovery of copper. Starting in October 2016, Taranis began reporting all of its findings using a method called "silver equivalents". Why? 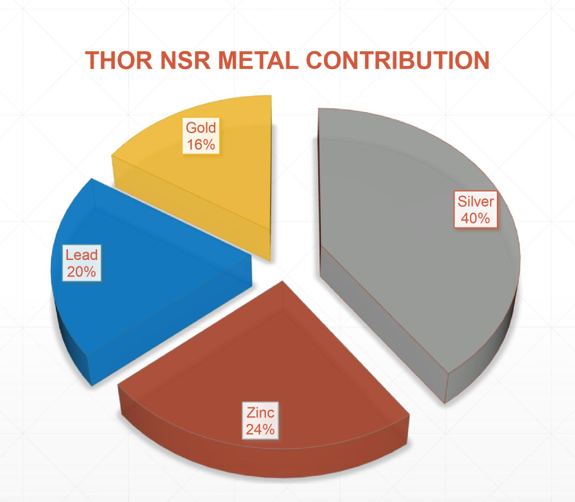 - Because Thor is a complex polymetallic deposit consisting of valuable concentrations of gold, zinc, lead and copper in addition ot the silver content, the significance of such a deposit frequently gets lost in the reporting of five different analyses. The AgEq value is essentially a simplified single number that converts all of the non-silver content to silver equivalents. This is done using current market prices that are outlined in the News Release. Use of the AgEq will enable our readers to quickly understand the collective grade of ALL of the metals in the Thor deposit.